Getting into a gift mode headset, it's that time of year when I take a look at our knobs from a different perspective. 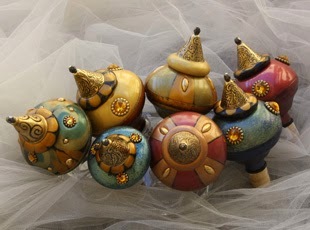 In many ways, this is how our knobs and finials have metamorphosed into Genie jars and bottle stoppers. I always like to say they make a great gift or treat for yourself. But since this is the holiday season, I throw my focus on expanding and embellishing our table top collections. Particularly the bottle stoppers have got some new looks and there's plenty of bling, color and architecture for those who love our designs. Of course we like to be in keeping with the cyber holiday shopping spirit. So we tossed in some bargains that can be found on our web specials. For those who want some help making a decision, I always suggest choosing the jeweled stoppers for the girls.